Compatible with WPML, WooCommerce 3.3.x, Visual Composer 5.1.x, Bootstrap 3.x. Gatsby has been tested with browsers IE9, IE10, IE11, Firefox, Safari, Opera, Chrome. 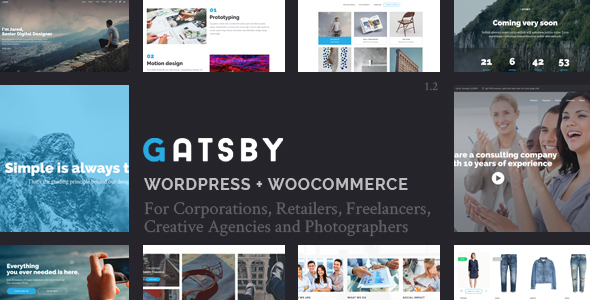 Theme Gatsby - WordPress + eCommerce Theme has the following features: Woocommerce site for Web agencies,, Single product, personal website,, portfolio and a lot more.